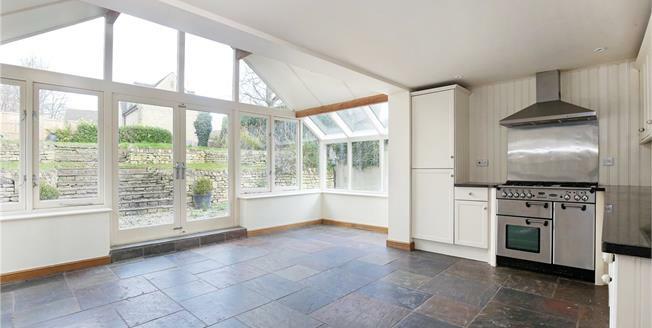 A charming and well presented detached Grade II Listed Cotswold stone cottage overlooking the Painswick stream. Thought to have been built to house staff from the nearby Mill, the cottage is believed to be around 200 years old and boasts many of the features typical of the era including a handsome Ashlar front elevation, Cotswold stone tiled roof, stone fireplaces and exposed A-frame beams on the upper floor. The ground floor is comprised of a snug with exposed stone fireplace, a sitting room and a spacious kitchen/dining room with striking glazed elevations overlooking the rear gardens. There are three bedrooms and a family bathroom with separate shower on the first floor whilst the upper floor is laid out as a single room with an open plan shower area to one end. A utility room and cloakroom complete the accommodation. The rear garden is mainly laid to lawn with a paved terrace looking over the millpond and steps leading down to a gravelled seating area adjacent to the dining room. To the front, the garden is paved with a beech hedge offering privacy and ornamental box hedges forming a boundary with the gravelled parking area. Painswick, the “Queen of the Cotswolds”, is a thriving community nestling in a delightful Cotswolds setting. Constructed of mellow locally quarried stone, the town has many beautiful buildings dating back as far as the 14th Century. The Village offers a playgroup and primary school with many secondary schools (including grammar schools) being available in the surrounding towns of Stroud, Gloucester, Cheltenham and Cirencester. Recreational opportunities include tennis, rugby and bowls clubs with many other groups including badminton, table tennis and pilates meeting at the Painswick Centre. In the wider area, events include polo at Edgeworth, racing at Prestbury Park and sailing at the Cotswold Water Park, together with shooting and fishing on local estates and golf at Gloucester and Painswick Golf Clubs. Painswick Churchyard is famous for its impressive array of table tombs and its 99 yew trees about which folklore holds that if a 100th should grow the devil will pull it out. There are several local shops, galleries, tearooms and restaurants in the village along with a pharmacy, doctors’ surgery and dentists whilst the surrounding towns provide a good range of social, recreational and retail amenities to suit all budgets.